A student who began her master's degree in May partnered with an international team of researchers to discover a special cosmic neighbor twice the size of Earth. Graduate student Merrin Peterson and a team of Canadian, German and American scientists used data from NASA's Kepler telescope to study Wolf 503b, a planet located 145 light-years away in the patch of sky where the constellation Virgo is visible. Merrin Peterson, an Institute for Research on Exoplanets (iREx) graduate student who started her master’s degree at the University of Montreal in May 2018. According to the statement, exoplanet Wolf 503b orbits an old "orange dwarf" star slightly dimmer than the sun, and goes around it quite closely and quickly — every six days. Wolf 503b is also fascinating because there's nothing in our solar system quite like it for comparison, according to university officials. Its size puts the exoplanet in a scientific sweet spot — Wolf 503b is in the zone where it might be a rocky "super-Earth," or gaseous like a "sub-Neptune." Kepler has studied the radii of thousands of exoplanets strewn across the universe, but because of a yet-to-be-well-understood phenomenon that researchers call the Fulton gap, there aren't many exoplanets 1.5 to 2 times the size of Earth. This is what makes additional observations of Wolf 503b — with a radius 2.03 times that of Earth — brimming with discovery potential. Typically, these Fulton-gap planets observed by Kepler are challenging to study. They orbit distant, dim stars, according to the statement, making it hard for researchers to figure out their density, measure the wavelengths of light coming from them or investigate their atmospheres. But this star is relatively close to Earth, making it appear brighter and riper for study. "Wolf 503b is one of the only planets with a radius near the gap that has a star that is bright enough to be amenable to more detailed study," Benneke, also at University of Montreal, said in the statement. 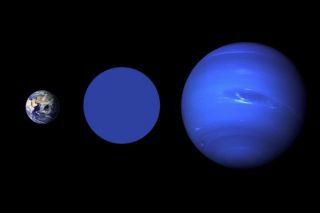 An artist's concept shows the size of super-Earth 55 Cancri e compared with Earth. A ground-based telescope in Spain was able to identify 55 Cancri e, which suggests that telescopes on the ground help in the search for habitable planets around other stars. And once the Jame Webb Space Telescope takes flight, scientists will be able to observe Wolf 503b for the presence of water in its atmosphere, or other chemical content. According to the research team, characterizing Wolf 503b's atmosphere will inform astronomers about what other Fulton-gap-size planets might be like. "Wolf 503b offers a key opportunity to better understand the origin of this radius gap as well as the nature of the intriguing populations of 'super-Earths' and 'sub-Neptunes' as a whole," the study authors wrote in their paper. The paper detailing Peterson's findings was accepted Aug. 30 for publication in The Astronomical Journal. Follow Doris Elin Salazar on Twitter @salazar_elin. Follow us@Spacedotcom, Facebook and Google+. Original article on Space.com.